With Thanksgiving around the corner, why not opt for something a little more inventive than Pinot Grigio with the family turkey dinner? For next weekend ‘s family gathering, consider a 9 pack of Cameron’s as your gift. 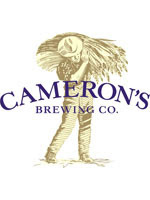 Cameron’s is available at The Beer Store, select LCBO locations and on tap at numerous bars and restaurants such as Earl’s, C’est What, Stout Irish Pub, Langdon Hall, the Royal Canadian Yacht Club and more.